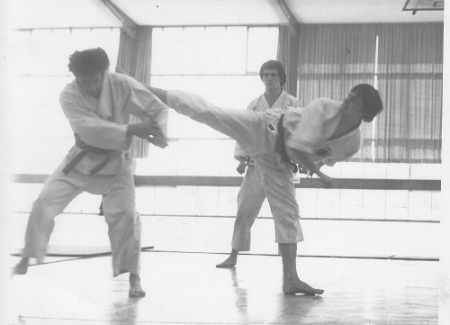 The British Universities' Karate Federation was the first body to attempt to organise University Karate in the U.K. 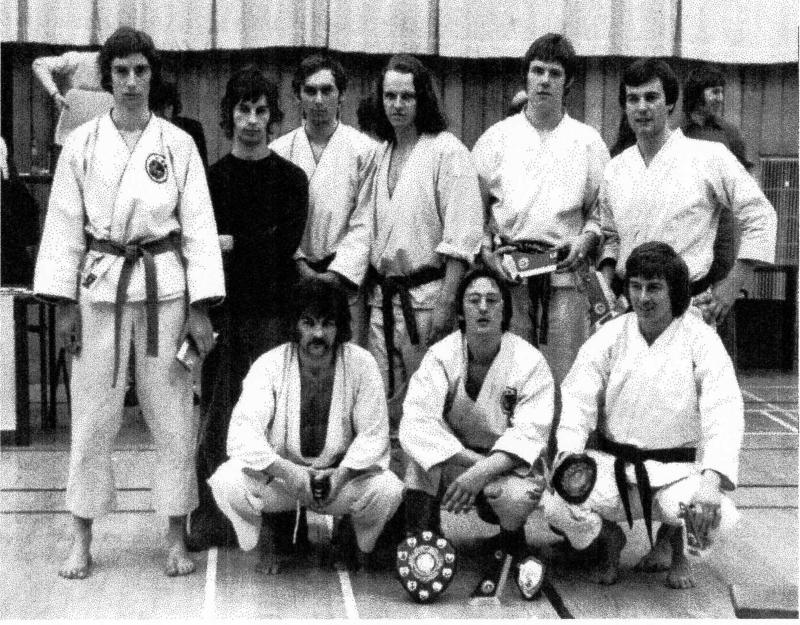 It was founded in 1968 by the Liverpool University Martial Arts Club, together with representatives from a couple of other colleges. Its aim was to promote the growth of student karate by staging an annual national student championship which would be open to any UK university or college karate club. Membership of the BUKF was simply obtained by sending representatives to the championship and paying a small fee to defray the expenses of the Japanese referees. 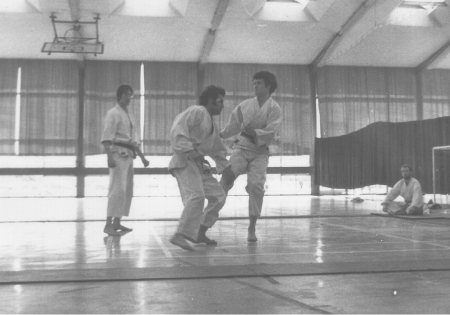 From the beginning all styles were welcome, though the original membership was almost entirely Shotokan, and Senseis Enoeda and Asano played a major role in the championships in the early days. The first championship took place in 1968. I have no documentation regarding the results, but my recollection is that the individual kumite champion was Steve Cattle of C.F. Mott College. The second championship took place at Liverpool University on 1st February 1969, and attracted participants from Bradford University, C.F. Mott College of Education (Liverpool), Liverpool University, Warwick University and Woolwich Polytechnic. An expected total of five teams from Cardiff and Aberdeen Universities failed to arrive, although Aberdeen did make the trip - a week after the event. On this occasion C.F. Mott College made a clean sweep; they defeated Bradford in the team kumite final by a margin of 3 ippons - 1 wazari, and the individual kumite final was between their two top contestants - Steve Cattle and John Errington. In a hard-fought encounter 3rd kyu Errington defeated his Shodan team captain by a margin of 1 ippon and two wazaris to 1 wazari. Steve Cattle did take something home however, winning the individual kata title with a display of Heian Yondan and Hangetsu. Because Liverpool University had superior sports facilities it was decided to hold the 3rd Annual championships there also, and these took place on 14th February 1970. There was an excellent turnout; in the team kumite event C.F. Mott made it to the final once more, but lost their title to Aberdeen University. 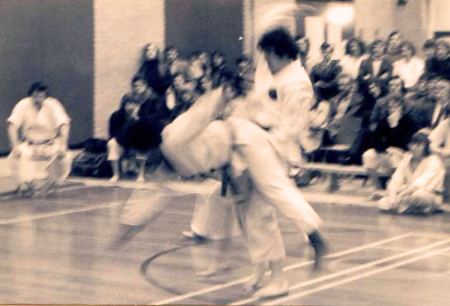 The individual kumite event was a mirror image of the team event; John Errington of C.F. Mott defended his title in the final, but lost to Paul Wong of Liverpool University. Once again Shotokan stylists had lifted the kumite titles, but in the kata event first place was taken by a Mushindo stylist - Les Stout of Walton Tech who performed Sanchin, the runner-up being Patrick Brennan, a Wado stylist from Sheffield University who performed Chinto. At a meeting held after the tournament Aberdeen claimed the right to stage the 1971 championships, and this was agreed to by general consensus. Following the 1970 championships, a number of concerned individuals felt that the BUKF should be set on a more formal footing, and a meeting was convened by Patrick Brennan (now at Newcastle University) and Ken Stopani of Bradford University to discuss possible ways forward. The meeting took place in Bradford in October 1970, and the outcome was that a constitution was adopted and a committee elected comprising Paul Wong as President, Patrick Brennan as Secretary, and Lee Ogden of Liverpool University as Treasurer. It was agreed that in addition to organising the annual championship, BUKF would encourage matches between member clubs and would publish the results in a periodic newsletter (it was felt a formal league was a bit too ambitious at this stage). In November 1970 the secretary made enquiries into the possibility of BUKF affiliating to the British Karate Control Commission. This was a body set up in 1967 following some unfortunate publicity and a police enquiry into the sport. As a result of the enquiry, the various Karate organisations were encouraged by the Home Office to form themselves into a federal organisation. This would allow them to maintain style and administrative independence, whilst permitting sufficient unity to enable them to exert some control over its members and prevent the spread of unofficial clubs. Its members comprised all the major Karate Associations at the time, but BUKF was in a different position to them, in that it did not represent a particular style, nor did it seek to award grades. One might draw a loose parallel with the relationship between the Football Association and Football League. The response from the BKCC was relatively encouraging, however other people within BUKF held the view that the way forward would be to affiliate to the British Universities' Sports Federation. This viewpoint won the day and correspondence with BUSF was initiated. The first crisis the committee had to deal with was the decision by Aberdeen to pull out of staging the 1971 championship, after they had made such a fuss about getting it. Fortunately Vincent Morris of Nottingham University offered to step into the breach and the 4th championships went ahead at Nottingham on 27th February 1971. It was a good move by Vincent, as Nottingham won the team kumite title. (I don't have a full record of the results, however I believe that Paul Wong retained his individual kumite title). A general meeting was held after the event. The existing officers were confirmed in office for a further year, and the committee was increased in size to five with the addition of Vincent Morris and Malcolm McPherson of Dundee University. The meeting also created a selection committee to pick a BUKF kumite team for possible future matches. This comprised Ken Stopani, Paul Wong, Ari Franklinos of Sheffield University, and Vincent Morris. Finally, Sheffield Polytechnic was decided upon as the venue for the 1972 championship. An attempt was made to organise a team elimination event at Newcastle on 8th May 1971 but attendance was very poor, and in the end a team was selected on the basis of numerous telephone conversations. 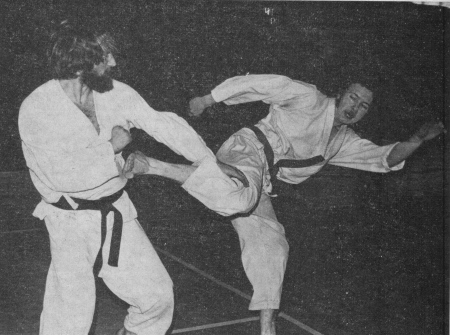 A match was held against the British Academy of Karate (an organisation run by Bryan Crossley) at Sunderland Polytechnic on 19th June 1971 which the BUKF won by 4 bouts to 2 with one drawn. The BUKF team on this occasion was as follows: Paul Wong (Captain), Malcolm McPherson, Ari Franklinos, John Lowcock of Sheffield Polytechnic, Vincent Morris, Patrick Brennan, and A. Holland of Sheffield Polytechnic. The fifth annual championship went ahead at Sheffield Polytechnic on 26th February 1972. Liverpool University won the team kumite title, beating Durham University by one point. 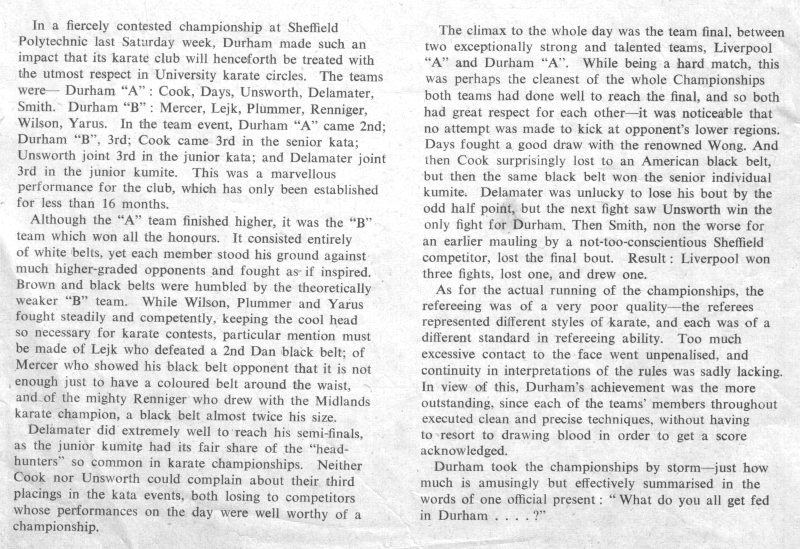 The Durham club was exceptionally strong at this time; their 'B' team, which was composed entirely of white belts, took third place. Paul Wong and Patrick Brennan were both coming to the end of the University careers, and resigned from the committee. Harry Cook of Durham University and Ian Truscott of Edinburgh University replaced them as President and Secretary respectively. Lee Ogden was confirmed as Treasurer for a further year, and Salford was decided as the venue for the 1973 championship. The new committee put fresh energy into the matter of affiliation with the British Universities' Sports Federation. This had a number of advantages. Not only would BUSF finance the annual championships, and a foreign trip every three years, but their secretariat would handle the contacts between clubs. This was an offer too good to refuse, and in January 1973 Ian Truscott advised members that BUKF would become part of BUSF for the academic year 1973-74. Another development was the establishment of a League competition. 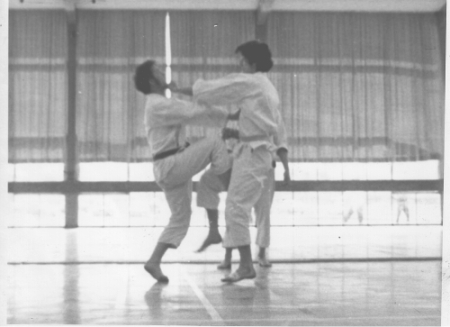 In 1994 BUSF merged with the Universities Athletic Union to form the British Universities' Sports Association (BUSA) and it is under the aegis of that body that a Universities' Karate Championships is organised today. Archived championships results going back to 2005 can be found on the BUSA website. I recently had the privilege of attending the 2008 Championships which were staged at the Concord Sports Centre in Sheffield on 15th and 16th March 2008. 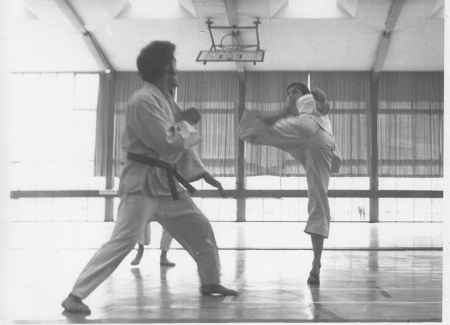 Kumite under WKF rules seemed strange compared to the contests of my day, but what hadn't changed was the enthusiasm and sportsmanship of the participants, who now of course comprise many young women as well as men. They all seemed to be enjoying their karate as much as we ever did! 1973 Durham University ? ? Salford? The following table lists a number of inter-university matches which took place during this period and were communicated to members via the newsletters. The following universities and colleges were affiliated at some time during this period together with the main contacts for correspondence. Among the names on the list are a few who have established world-wide reputations as karateka of the highest ability. BUKF membership was always very fluid as it depended upon enthusiastic clubs officials, and when they finished their courses they were not always succeeded by individuals with the same motivation. Clubs were also dependent upon their Athletic Unions for financial support, and sometimes this dried up.